Here's another jam that seems ripe for the summertime. 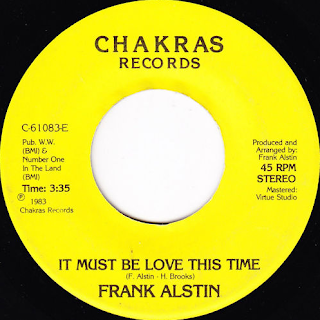 I know very little about Frank Alstin, however he had quite a few tries at this particular jam. This version has a very home spun almost demo tape sound to it. He recorded it again in 1986 with the fabulous Jean Carne. And, in 1992 it was revamped and given a few 'house' remixes and released in the UK. We know close to nothing about the rest of his career, but this little slab of funk boogie soul definitely increases the desire for more of the same caliber. He did pen a few songs for First Choice, Loleatta Holloway, Sandra Phillips and The Jones Girls. Not a bad gang of folks to be associated with! This earliest version is the best version in my eyes, but it's hard to deny the excellent vocals from Jean Carne. This version lacks those extra female vocals but does have a crisp snappy funk feel and some excellent synth soloing. Although a lot of the versions out there are dated 1983 but, seem to be the later version from 86. I'm happy to share this track as it seems to be the hardest version to come by and doesn't go for cheap these days. I hope you enjoy. Hello Sound Boutique, Frank was one of my best friends. We used to go to the Shoney's breakfast buffet near Philly International airport to eat them out of business then Frank would order a diet soda after all that food. 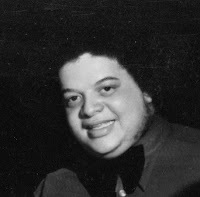 He had a great sense of humor.He was a carpenter and played a left-hand Fender guitar very well.Frank toured with Gladys Knight,Charlie Brown's Coasters and many others.He lived in the University City section of Philadelphia.Frank and his wife died in a car crash on the Atlantic City NJ. expressway in the nineties. I really miss him and so did the Philly music scene, because everyone had been touched by the musical talents of Frank. One of his favorites lines was "YOUR BEAUTIFUL AND YOUR FRIENDS,ARE BEAUTIFUL TOO". Thank you keeping my friend's music going he would have loved that. Doug!!! great to hear from you!! Thanks for the info...love to hear stories like this.. has been something I enjoy doing this blog! I'd like to get in contact with you more so please hit me up... I'd really like to speak woth you more!!! Thank you for sharing!!! and please stay in touch! !